Art rock ensemble Hildegard, led by Cliff Hines and Sasha Masakowski, is lurching towards galvanizing instrumental fusion with this self-titled debut release. 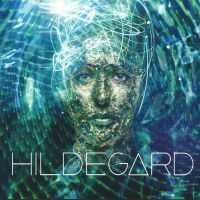 Veering off in different directions, Hildegard sews up an ambitious collage of rhythms and harmonies, ranging from steadfast to conducting a racket of almost provocative proportions. And while complexity alone isn’t a guaranty for quality, Hildegard’s unique musical vision is employed as a guide to musical greatness. It’s a challenging listen, alright, but highly entertaining on a purely artistic level. Sasha Masakowski’s voice resonates in heavenly fashion, while the meat of the story is served up by Hines’ expressive guitar work emulating all shapes and colors, doing voice box on “Austria”, at one point he’s engaged in a beefy riffage on “Sally Brown”, before settling for the tranquil Latino breeze of “Siren Song”. Placid beauty is to be found on “Cabin”, the albums longest composition craftily built around Sasha Masakowski’s delightful vocal delivery. Arrangements are watertight, channeling guitar and keyboard pyrotechnics, mixing the lot with an ear for charming pop melody. Inspiring!